Buses from Treviso airport to Venice. Tickets for airport buses, fares 2019 and timetables. This article deals with airport buses from the small Treviso airport near Venice, which is used by Ryanair, among others. Information about airport buses from the major airport of Venice (Marco Polo) can be found on another page. If you buy your ticket on the Internet before you go to Venice, you save yourself the hassle of searching for the right ticket counter, queuing and having to deal with foreign language problems. In our opinion, the Express Bus is the best way to get from Treviso Airport to Venice. Taxis are expensive, other public transport options are cumbersome because you have to change Buses and trains. There are single tickets for 12 Euro, a return ticket costs 22 Euro. They are modern buses with free WI-FI and so on. The travel time from Treviso airportz to Mestre is about 55 minutes, then the airport bus continues to Venice (total travel time about 70 minutes). There are about 20 buses per day in both directions. You can pay the tickets on the Internet on the well-known website Getyourguide simply with Paypal or credit card. The tickets from the "Aeroporto di Treviso-Sant'Angelo", as the smaller airport of Venice is officially called, cost 12 Euro simply or 22 Euro round trip (in January of 2019). In our opinion this price for expensive Venice is ok. Unfortunately there are no discounts for children. The distance is about 30 km. The bus stops in the suburb Venice-Mestre on the mainland and in the old town of Venice at the bus station Piazzale Roma. This is where all the buses arrive in the lagoon city. Venice's main railway station for long-distance and local trains is just 200 metres from the bus station on foot over a new bridge. However, most holidaymakers change to one of the many public water buses (ferries) at Piazzale Roma. You can also buy day tickets and multi-day tickets on the internet for the water buses. The timetable of the express buses is not identical every day, it depends on the flight schedule. In total there are about 20 buses a day in both directions. There are no buses at night. On average, there is more than one bus per hour during the day. First bus in the morning: From Venice, the first bus departs before 6 o'clock in the morning, from the airport at approximately 8 o'clock. Much earlier, no flights arrive, thus an airport bus in direction to Venice is not necessary. The last bus in the might: In the evening, the airport buses depart from Venice to Treviso until approximately 19:30. In the other direction from the airport, the last bus usually leaves at 22:15. The travel time to Treviso airport by bus is just over one hour from to Venice and just under an hour from and to Mestre. 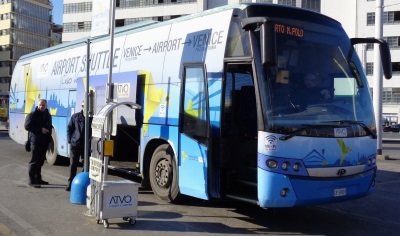 The express buses to and from Treviso Airport are operated by the AVTO public transport company. The city of Treviso (also written "Trevixo" in local language) is a small city with 80.000 inhabitants about 25 km northwest of Venice, thus towards the Alps. Especially so-called cheap airlines use the airport. The airport is often called Venice-Treviso, although it is not located in the municipality of Venice. Ryanair uses the airport frequently, but also other airlines like Wizz Air and so on. After all, every year more than 2 million passengers use the smaller of the two airports near Venice. There are airport buses to Mestre and Venice, but also to the town of Treviso, which is only 3 kilometres away. The bus stop is quite easy to find at the rather small airport.